Remember my adventures in Rogue? All my gauge issues and time spent with the hair dryer? Turns out that the Jo Sharp Silkroad Aran does not just bloom and grow on the first wash, but also on the second and the third. I measured Rogue after its Eucalan soak today and the bust came in at a whopping 42″. I have a 34″ bust, people, and that’s on a good day. I laid Rogue out to dry next to my Hourglass sweater and it was comical. The two sweaters didn’t even look like they belonged to the same person. I got out my trusty hair dryer again, gave Rogue a few half-hearted shots of heat, sighed and gave up. I needed more power. So I gathered up my Rogue, cradled it as if I might never see it again, apologized for what I was about to do to it, took it downstairs, and threw it in the dryer. Ten whole minutes passed. Ten minutes on permanent press. I tried not to think about what might be happening in the dark and lonely confines of the dryer. I thought I heard Rogue screaming. I opened the dryer and peeked inside. What size person would Rogue fit? A toddler? A tween? Rogue was noticeably smaller, but was thankfully not toddler-sized. Hoping against hope, I tried Rogue on. It fit, it fit, it fit! Wheeee! Scarcely believing my good fortune, I grabbed Rogue and ran upstairs. A tape measure confirmed: 38″ across at the bust, 18″ from armpit to wrist. Now, laying next to the Hourglass, they looked like they belonged to the same person. Thank you, thank you, Gods of Dryers and Knitting and Sweaters and Wool. I promise I will never fudge a gauge swatch again. Afterword: Some of you may be wondering…why on earth was I laundering sweaters today? Surely I have not been decking myself out in aran wool in 90-degree heat? Relax. No, I have not. CogKnition posted this on August 13th, 2006 @ 5:42pm in Life as a Knitter | Permalink to "Extreme Sweater Laundering"
Hooray, glad you were able to shrink it without ruining it (although I guess at that point, what did you have to lose?). My handwashing sits around for weeks and months too. Yay! I am so pleased the sweater drama worked out! Rogue looks lovely, by the way. I don’t think I’ve seen it before. 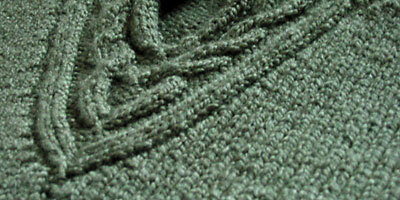 I wonder if all Jo Sharp Silkroad is like this – I’ve been thinking about the DK for a sweater for myself. Part of the problem might be that the gauge of the sweater was really much too loose a gauge for the yarn. If you actually knit and wash at a proper gauge, you might not see so much growth in the finished garment.